Whether you’re training a puppy or starting a new job, an indoor dog potty is the best way to keep your pup comfortable. You won’t come home to a mess after work, and with grass pads, your puppy will get the idea. We’ve compiled the best indoor dog potty reviews that we could find so you can make an informed decision. Here are some things you should know before you start shopping for the perfect indoor dog potty. Type: There are a few different types of dog potties, including puppy pads and grate designs that allow the waste to fall through to a pan underneath. Some even include a grass pad for picky pups or training. Dimensions: How big is the indoor potty? You’ll need one that fits the size of your dog, and also one that will fit in your space. Keep this in mind before you buy, because these are important! 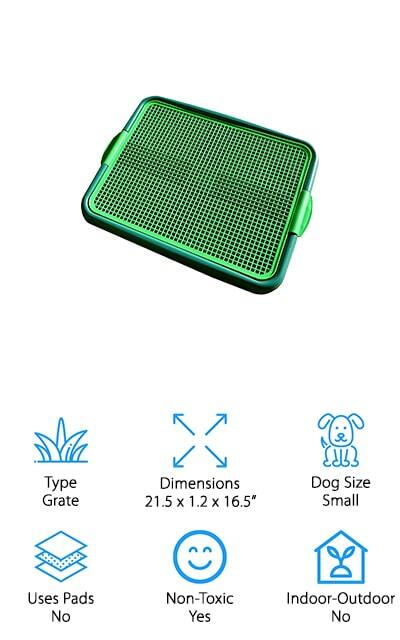 Dog Size: This will tell you what size of dog the indoor potty is made for. This is important to keep in mind because you definitely want to get a potty that is perfect for your dog. Uses Pads: If a potty uses pads, it has an absorbent sheet that you can change when your dog uses it. This eliminates the need for a drawer that catches the waste. It’s a much easier cleanup than a padless potty. Non-Toxic: It’s important that your dogs’ indoor potty is non-toxic. You don’t want any material to harm your dog, so we’ve made sure that these indoor potties are safe for even the most sensitive dogs and puppies. Indoor/Outdoor Use: Can the pad be used both indoors and outdoors? If you need a dog potty that you can use both ways, you’re going to want to make sure that the one you choose is recommended for this use. Now that you know all there is to know about these products, we can get into the indoor dog potty reviews. Through all of our research, we’ve tried to find the best indoor potties that take into consideration the size of your dogs and the most sanitary clean-up method. We’ve made it easy to choose the one that works best for you! Our top pick and budget pick are highlights, so check them out first. 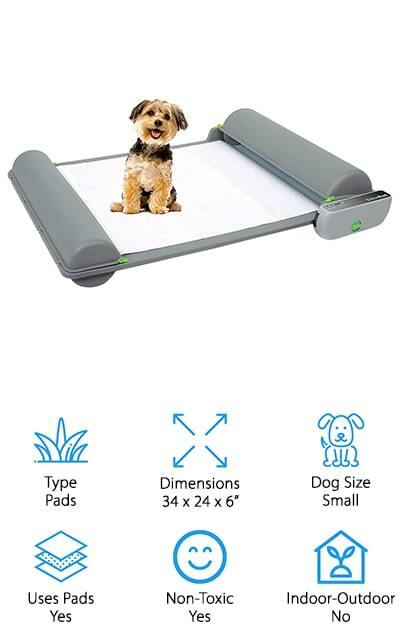 The best rated indoor dog potty on our list is this BrilliantPad machine. That’s right: it’s a machine that cleans itself. The 2.0 model of the BrilliantPad is much like its predecessor, but it includes a drip lip that prevents spills on your floors. The main draw of this machine is that it’s self-cleaning. The machine wraps and seals waste so that you can clean up easily, and the potty won’t smell. It will also prevent your pup from tracking waste through your house. It uses a pad that’s made of five layers of absorbent materials, so it’s going to catch everything. It’s even got an automatic motor so that it won’t start while your dog is on the pad. This machine is great for small dogs, as well as potty-training puppies under 25 pounds. It’s small enough to fit in tight spaces and is lightweight enough to move around if you need to. It’s pretty advanced! This indoor dog potty by Any Pet is a great value for training your pups! This is the first grate-style potty on our list. All of the liquid waste drains down through the grates and collects in a tray underneath. You can place a pad or newspaper under in this tray for easy cleanup. Your dog’s paws will stay dry, and all you have to do is clean the solid waste off the top. This prevents your puppies from chewing on the pads or tracking waste throughout the house. It’s great for small breeds or even older cats that are having trouble using the litter box. It comes in a green or pink color, so you can choose the one that will go best in your home. Plus, the bottom of the unit has rubber feet to prevent the pad holder from sliding all over the floor. It’s a great, inexpensive way to train your younger puppies! 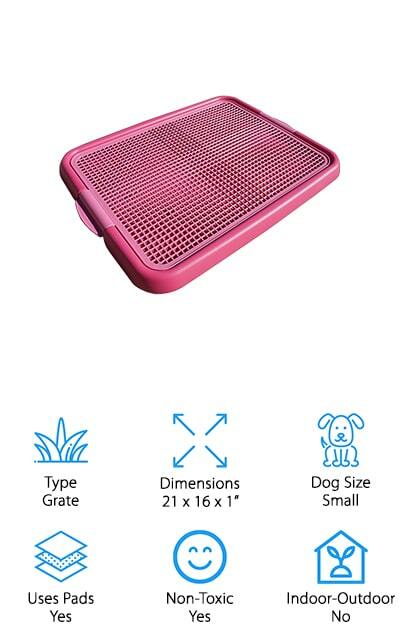 This Klean Paws indoor dog potty is another grate-style device that allows all liquid waste to flow down to a pad or newspaper in the tray underneath. This means that you can clean up easily without spilling waste everywhere. Save your floors from your pups-in-training. It keeps the puppy pads locked away so that your dogs can’t chew on them or pull them around. No more bunched up pads exposing your floors! This also means that you can potentially use pads for longer periods of time, so you don’t have to buy pads as often. We love that you can keep your dog’s paws dry and won’t have waste tracked through your house. It’s great for smaller dog breeds, puppies, and it’s even useful for cats that can no longer make it to the litter box. It’s easy to remove the pad, and the grate snaps on and off easily so it’s no additional hassle to keep it clean. 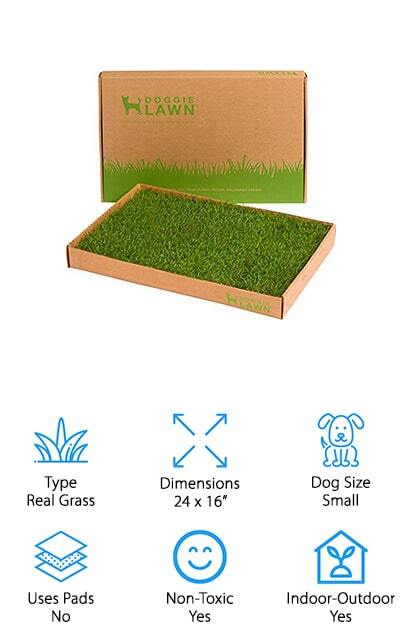 DoggieLawn makes the first real grass indoor dog potty on our list. This is a small pad of real grass turf that can be an invaluable tool when you’re training puppies to go outside. It’s also great for busy lifestyles, for the occasion when you aren’t going to be able to take your dog out to do its business. You can even use it if you have older dogs that are having issues going on walks. It comes in a variety of sizes, this smaller one for dogs up to 25 pounds and additional sizes for medium and large dogs. Because it’s made of real grass, it neutralizes odors to keep your home smelling fresh. It includes a cardboard tray that you can remove and replace to catch the waste. Replace the grass every few days for best results. If training your dog to go in the grass has been a challenge, consider a DoggieLawn! 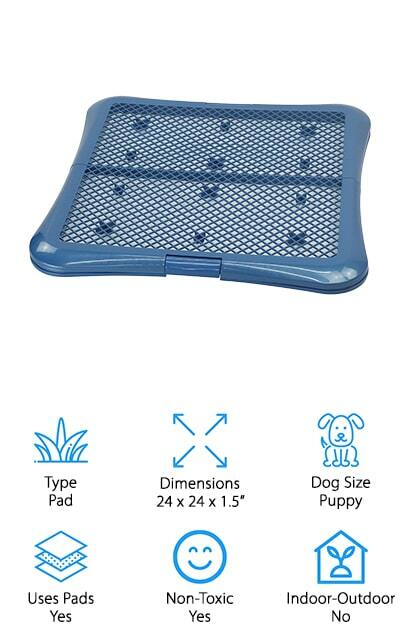 Petpahbet’s Puppy Training Pad is a simple construction that’s meant to snap your dog’s puppy pad into place. That way, the training pad won’t tear or shred. Your pup won’t be able to bunch it up when they’re done with it, and they won’t’ have the access to the edges to chew it up. It’s a great solution if your pup has trouble with traditional puppy pads. Plus, if your puppy really has to go, the liquid waste won’t overflow the edges of the pads. To change, you only have to unclip the top, lift it, and remove the pad. There are rubber feet to help the grid system on the top stay in place. For your new puppy, go with the hassle-free way to potty train. It’s even easier than just using puppy pads. You can even use it if you have older dogs that might be having control problems, especially if those dogs are on the smaller side. 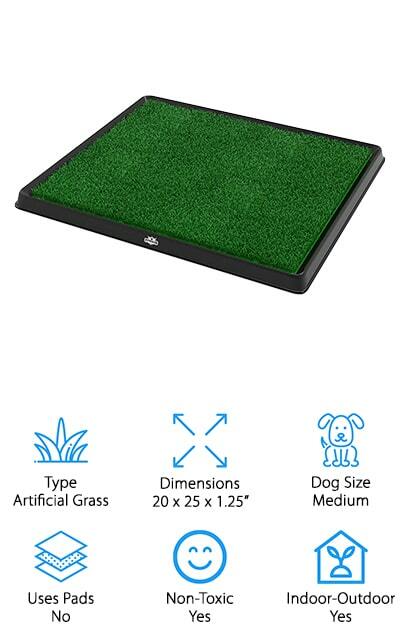 Sonnyridge makes this artificial grass pad that will help train your pups to go outside quicker than you ever thought possible. It’s also useful if you live in an apartment or are on the go a lot so that your pup doesn’t have to make a mess on your floors. It’s a synthetic surface that feels and smells similar to grass. It’s antimicrobial as well so it absorbs odors and prohibits the growth of bacteria. It’s easy to clean – you only have to rinse the artificial grass with soapy water and let it dry before use again. The bottom is a tray that you can remove and clean when your dog uses the pad, and this way you won’t risk ruining your floors. If you have a balcony, you can even put it out there to help get your dog used to going outside. It’s a versatile dog potty that’s helpful and easy to clean! 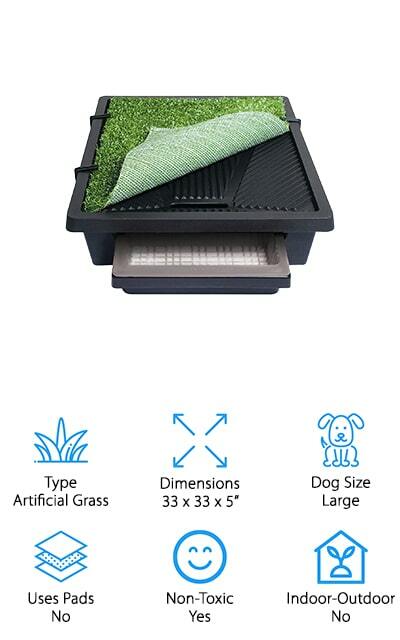 This artificial grass pet potty can be used indoors and outdoors – great for a balcony outside your apartment, or for use in your sunroom. If you are training a puppy with one of the smaller sizes available, it’s great to help them transition to going to the bathroom outside. It will be familiar, and they will be more comfortable using it. If you are often late getting home, it can be beneficial to have a pet potty set up so your pups don’t make a mess. It’s non-toxic and weatherproof, and hassle-free. It’ easy to clean with soap and water, and helps keep your home tidy. Save your carpets by preventing accidents with this natural-feeling grass pad. It’s portable and lightweight, so you can move it as often as you’d like. Your dog will be comfortable using it, and this potty is a great, convenient addition to your routine. You’re going to wonder what you did before buying one! 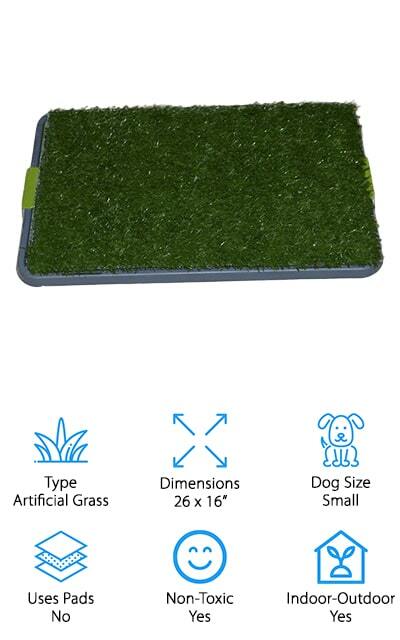 PETMAKER makes another artificial grass pad made for medium dogs. There are other sizes available, so make sure that you’re choosing one that your dog can use. This particular pad uses a three-layer system that includes a top layer of grass, a middle plastic insert that drains liquid, and a collection tray that’s easy and sanitary to empty when you’re ready. To clean, just rinse each layer with warm, soapy water and it will be good as new once it’s dry! It’s great for use on patios or balconies if you live on the top floors of your apartment building. It’s great for older dogs that are having control problems and can’t make it outside every time as well. There is a range of benefits associated with getting an indoor potty like this one. Your pets are going to love the feel of the artificial grass, and you’ll love how clean your home stays when using this pad! PetSafe makes indoor dog potties in all sizes, though this one is large. If you need an extra-large indoor dog potty, you can find it here for larger breeds such as huskies and retrievers. 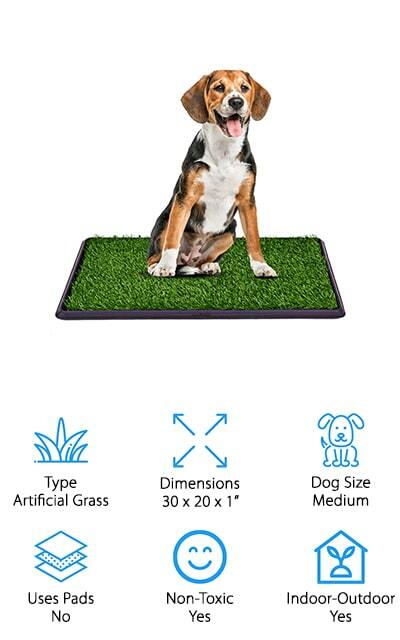 If you work a lot or have an apartment where you can’t take your dog out as much, consider getting one of these artificial grass pads. It’s unique on our list because it includes a power on the very bottom of the waste bin that turns liquid waste into a gel so you can get rid of it easily. This also traps the odors. 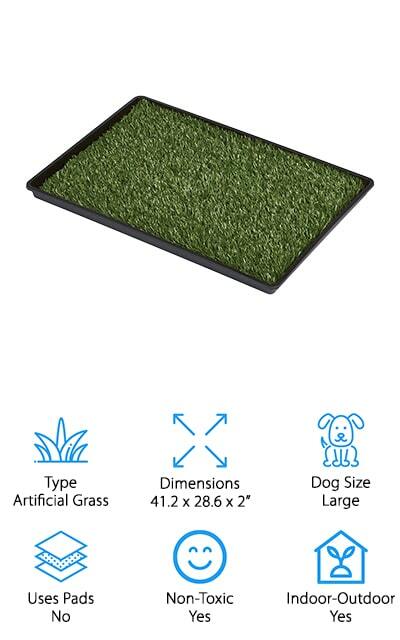 If you’re looking for a grass pad that comes in multiple sizes and is easy to clean up, this is the indoor dog potty for you. Simply wash it down and dry it out to keep the grass fresh and you’ll be good to go. Keep your pets comfortable and your home clean with this convenient dog potty. Prevue makes this artificial grass potty that’s portable and lightweight. It’s super easy to clean – simply remove the tray with the waste and brush through the grass with warm water and a mild detergent. When it’s dry, it’ll be good as new! The artificial turf has antimicrobial odor control, and it’s soft and realistic so your pup won’t have a problem if they need to use this occasionally. This particular model is an indoor dog potty for large dogs, though they have other sizes for smaller dogs available. You can use this potty both indoors and outdoors, to help make the transition for a pup in training that much easier. Plus, older dogs that are on the larger side will still be able to have that comfortable, outside feeling with Tinkle Turf. Protect your floors and keep your larger, aging dogs more comfortable with this large-sized artificial grass pad from Prevue Pet Products. You and your dog will love it!